This Sunday is the celebration of “Christ the King,” the last Sunday in the Western Church year. Mainline Protestantism seem to take this celebration in stride, as if it were as ancient and venerable a part of the calendar as Easter, or Lent, or even Christmas. The youngest of those key celebrations go back a millennium and a half. The oldest go back to the very beginning. Christ the King? Not quite a century. The Roman Catholics instituted Christ the King in 1925. But then they created the three year lectionary after Vatican 2 in the 1960s. It seems that when the Protestants adapted and adopted the Catholic lectionary (completing the process with the RCL in 1994) Christ the King came along for the ride. We live in a world where all matters of religious and spiritual conviction have been reduced to a sort of marketplace. We pick and choose, using our individual discernment and taste to take what we like, or want, or need, and leave the rest behind. And in our well-intentioned efforts to love our neighbors who hold different convictions, we soften any, or at least many, claims of particularity for our faith. The story of the Good News of Jesus is that the world was under Satan’s reign, but it is no longer. 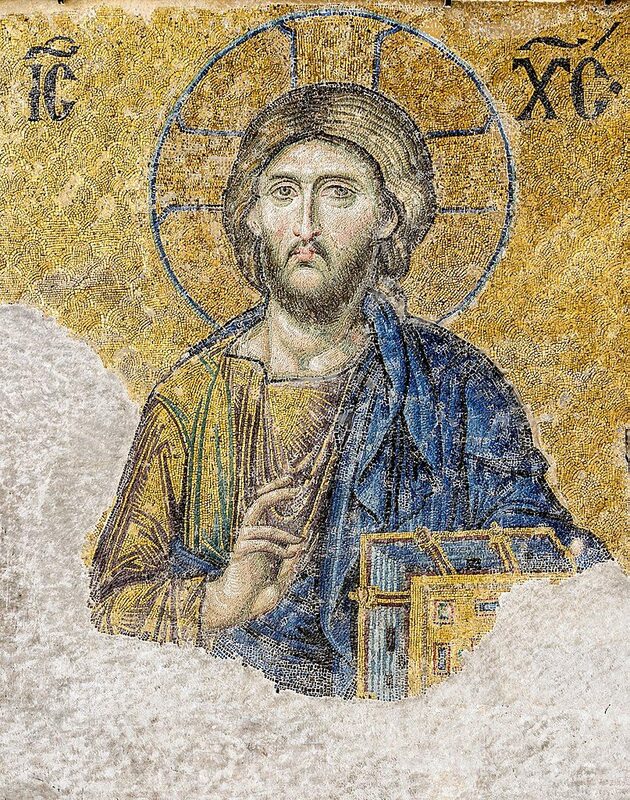 Christ reigns as the Ruler of All, the “Pantokrator,” which is the name of the icon inside the dome of many an Orthodox church. He looks down on us, his followers, who presumably are under his more particular reign, despite our behavior to the contrary. He’s wild you know. Not like a tame lion. In the lectionary’s Year B, Christ the King has us in John 18:33-37. It is Holy Week. Jesus has been arrested. He stands before Pilate who peppers him with questions. But let’s not go there. It isn’t part of the reading. Let’s instead focus on two aspects of Jesus’ answers to Pilate’s anxious stammering barrage of questions. In the preliminaries, Pilate asked Jesus if he were king of the Jews. Jesus replied by strongly implying that Pilate was a tool of other people, without a thought of his own to his name (vs. 33-34). But when Pilate presses the question, asking just what Jesus did to get arrested, Jesus responds. Christians have tried to make it seem as if Christ’s kingdom is actually here on earth. That includes medieval Catholic claims of papal power over heads of state, and his direct rule of territories. That includes Orthodox so intertwining of the Church with the state that when states make troubling decisions the Church appears to endorse them. That includes Protestant claims that America is in some sense a Christian state, and that this should somehow limit the rights of those committed to other religions. And ever since 19th century and the rise of classical liberalism, Christians have from time to time viewed their mission as bringing God’s kingdom on earth — even transmogrifying this into the views of 20th century evangelicalism. But in the Bible Jesus doesn’t try to lay claim to an earthly kingdom, either when offered one by Satan or when pressed toward it by zealots among his followers. Jesus told the earthly authority that his kingdom was absolutely not of this world. And for his followers, the point is that their primary allegiance, their citizenship beyond any earthly country, is in that unearthly kingdom. What is this “not of this world” Kingdom? Well it isn’t about a political allegiance. The language of kingdoms and citizenship is only an approximation, the best attempt that human language can make to capture it. Ultimately it is commitment to truth. Q: Are you a king, Jesus? A: I came to testify to the truth. That’s his definition of the Kingdom. At least one of his definitions. He has a whole bunch of parables that also try to define it. We Christians sometimes get kind of goofy about our commitment to the truth. We proclaim that the Bible is God’s Word, and we treat it as a list of clear and definable propositions about all the things that we need to know. Then we end up proclaiming things adamantly as absolute truth while many people who actually study those things — like scientists, and historians, and archaeologists — come to very different conclusions. Jesus wants us to be deeply committed to the Truth. We can start with the simple and straightforward sense of accepting evidence. Like, rather than fooling ourselves based on ideological propaganda. And in a rather different way, Jesus, also in John, says that he personally is the Truth. Truth is a person, not a proposition. Truth is a person, not a political party. Truth is a person, not an ideology. If you know him, seek to know him better, and to follow him wherever he leads. And if you really belong to the truth, you’ll recognize his voice calling. There is even an option to use the materials as an adult education class for your church. I had a professor at seminary who thinks theologians misunderstood scripture. Most theologians look at scripture as a means of figuring out an “ontology” of God (“theo-logy” proper, which is, “words *about* God”). However, his view is that scripture is “instruction” in its entirety, which teaches us how to *be* God’s people. It’s through this instruction that he’s leading us. And, it all boils down to: love God and love neighbor. It works! Nice to see your face here as well as your words. I’d have to hear more, of course, but it seems that both OT and NT have knowing God personally at the core of their message. Teaching how to be God’s people is relational: Love God, know the Word made flesh, follow Jesus. And when the icon shows us Christ as Ruler of All, we find ourselves under his very personal gaze. And a happy Thanks giving to you too! Don’t worry — if you don’t regularly preach the lectionary text, then your congregation probably won’t notice when you randomly do so on occasion! PS — Blessed Advent and Christmas.. Thanks Brint! Blessings to you and Karla & Co, as well.